Setting up a Warp theme follows the standard WordPress installation procedure and works like with any other theme. In order to download the current version, please visit wordpress.org. Please check WordPress Codex for information on how to install WordPress on your server. Once WordPress is successfully installed, you will have to upload the theme to your WordPress directory. Download and un-zip the theme-package folder. You will find 4 folders and one of them 01_Theme. There are two zipped theme folders 01_theme_v1.0.0.zip and 02_theme-Child-Theme.zip. If you want to use a child theme, will have to install two themes. Open your WordPress dashboard. Go to Appearance > Themes. Click the Add New Theme button, then Upload Theme and select the 01_theme_v1.0.0.zip file. Click Install Now. Once activated the theme will be display a notification to install and activation the required plugins. 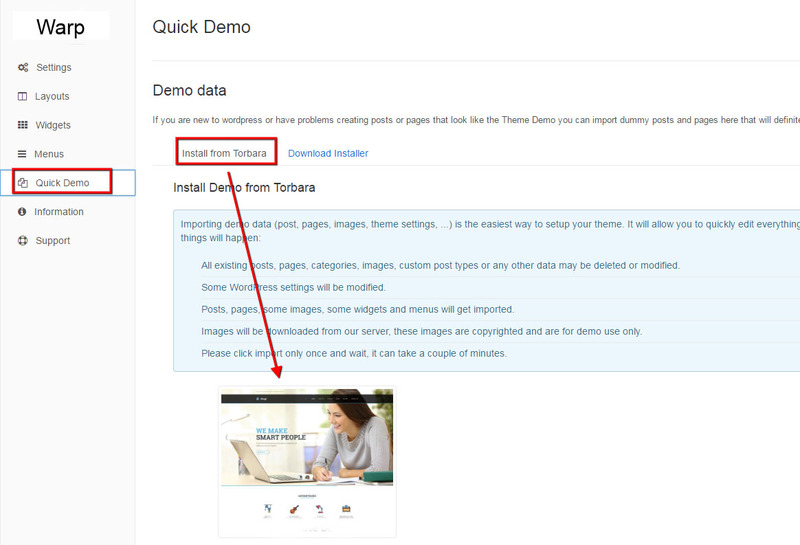 Go to theme settings->Quick Demo-> "Install from Torbara" tab and click on the picture. The Installation of demo data should take a few minutes. If it takes a very long time or causes the error, most likely, your hosting have a poor performance for the correct installation or some settings don't meet the requirements. This problem can be solved by installing the theme with Quick Start package. As the result, you will get the WordPress+ Theme+Demo data. To download this package, switch the tab "Download Installer" in Demo data section.